Ahh May, the rest stop before summer. This is about the time we start embracing the sun, anticipating the summer months, and planning out & preparing for new adventures. We had plans for the long weekend, none of which panned out because Ryan & I ended up fighting a cold. 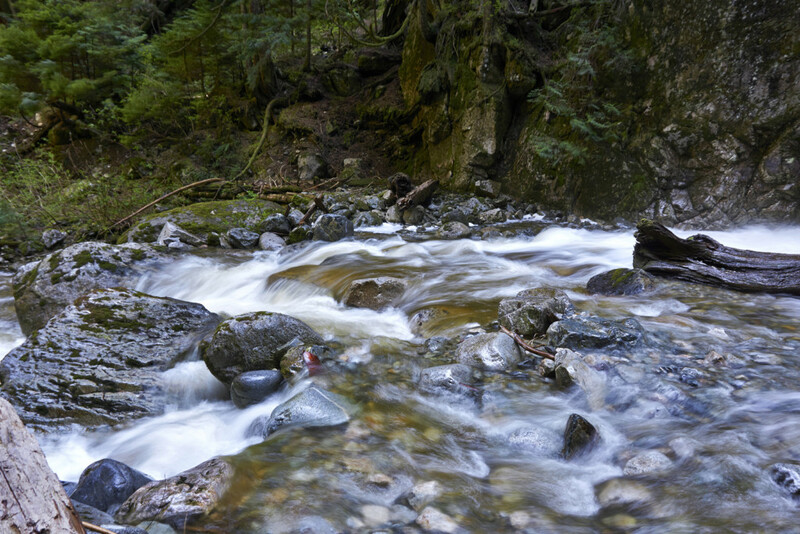 By Monday, we were eager to get out, and decided to check out the Mosquito Creek cascades in North Vancouver. More and more often, I realize, the best areas on the shore get significantly less attention. Amidst three ski hills of record-setting attractions and incredible natural beauty, the simple, forested, and heavily scarred Mt. Fromme is a great area to explore. 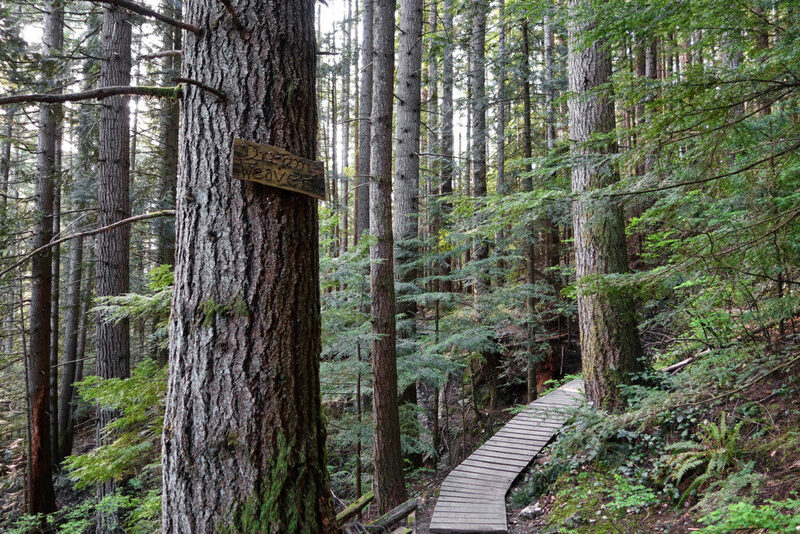 The Cascades Trail boasts remnants of corduroy roads, old fire hydrants, and other remnants of the old logging days. If you look carefully, you can find the odd surviving big tree. 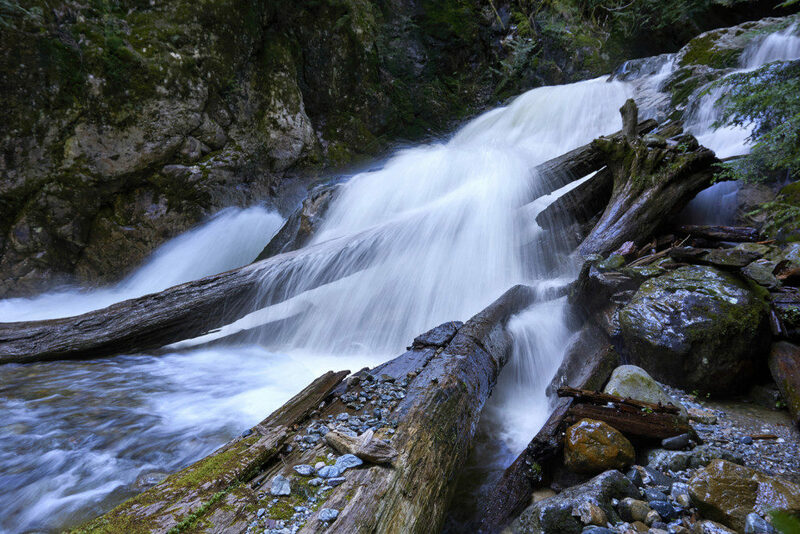 The cascades are beautiful, especially during snow-melt, but my favourite part of the hike was seeing the forest reclaim it’s territory by covering up and hiding logging remnants along the trail. Area: Mt. Fromme, North Vancouver, BC. 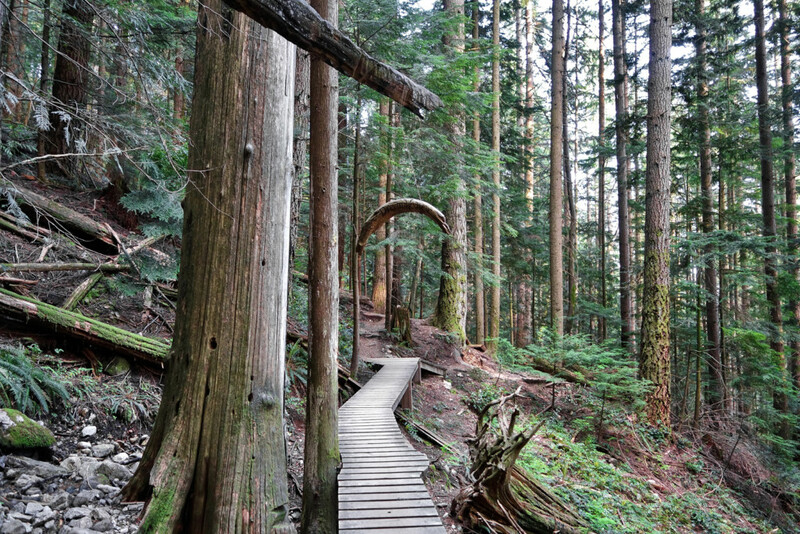 Objective: Mosquito Creek Cascades via Cascades trail and loop back via Dreamweaver trail. 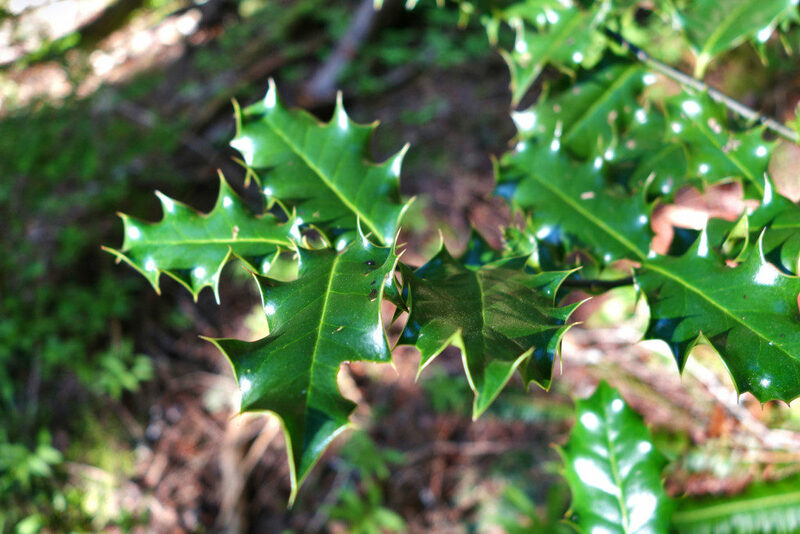 Nearby hikes: Many. You’re better off googling “Mt. 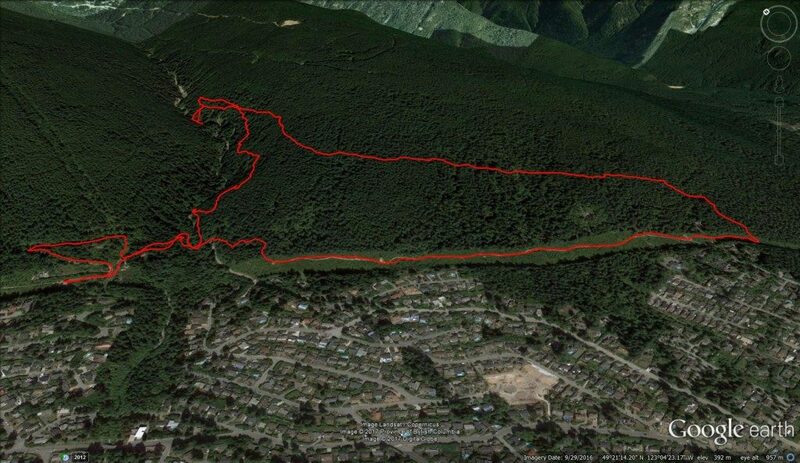 Fromme hiking trails” or “Grouse Mountain hiking trails”. 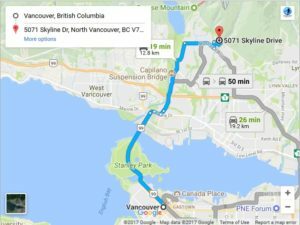 Good to know: Mosquito Creek is the dividing line between Mt. 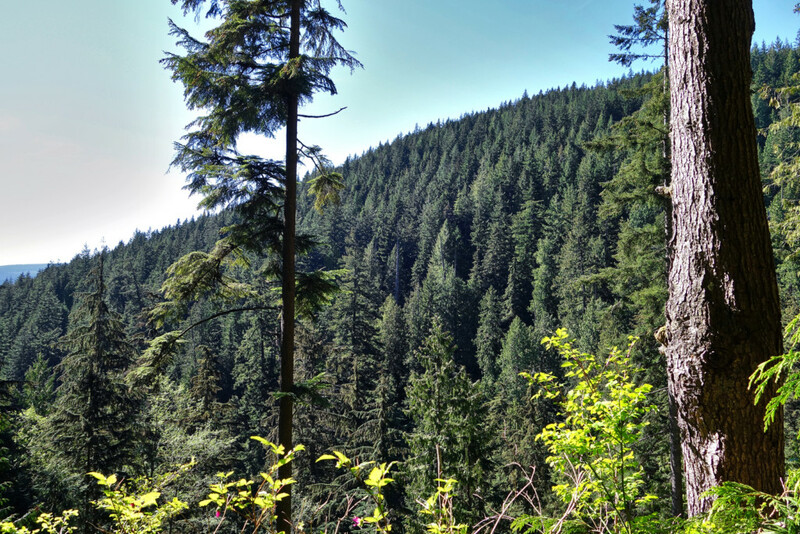 Fromme and Grouse Mountain. Trails on the east side of the creek belong to Mt. 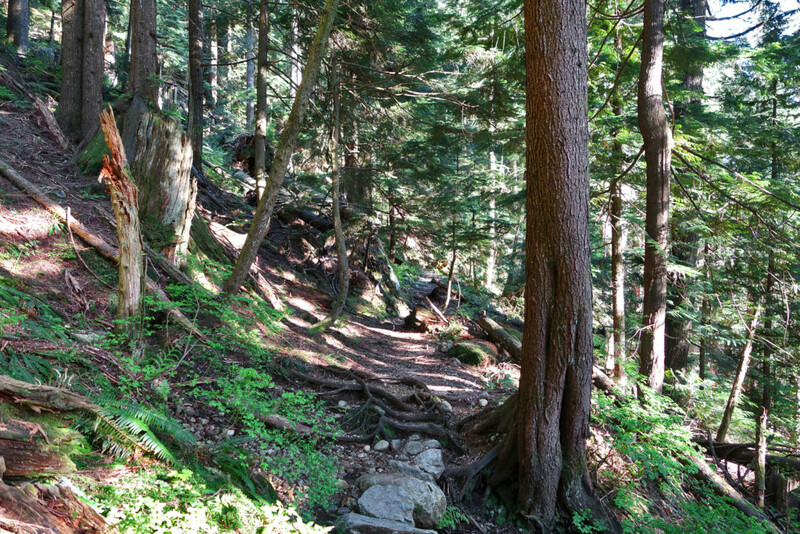 Fromme and trails on the west side belong to Grouse Mountain. There are old artifacts along the trail, including the old damn, a few hydrants, and some piping along the old spur roads. 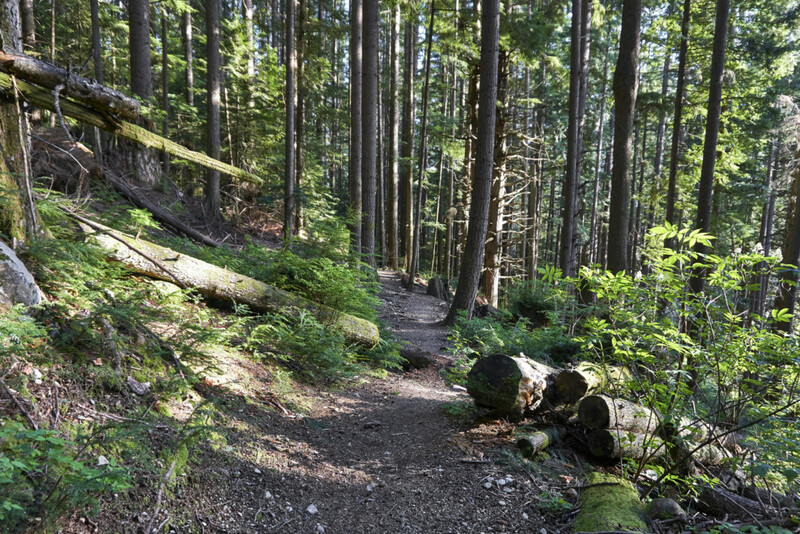 If you want to avoid crowds around the North Shore, hike on Mt. Fromme. Head north on BC99 over the Lions Gate bridge. Take the Marine Drive east exit. Merge on to Marine Drive and turn left on Capilano Road (signs for Capilano Road). Continue straight for 3.7km, then turn right on Montroyal Blvd. After ~1.5km, turn left on Skyline Drive. Follow Skyline Drive to a parking area with a trail kiosk. Note: Below is a description of our route. Very few junctions and trails were labelled or signed. 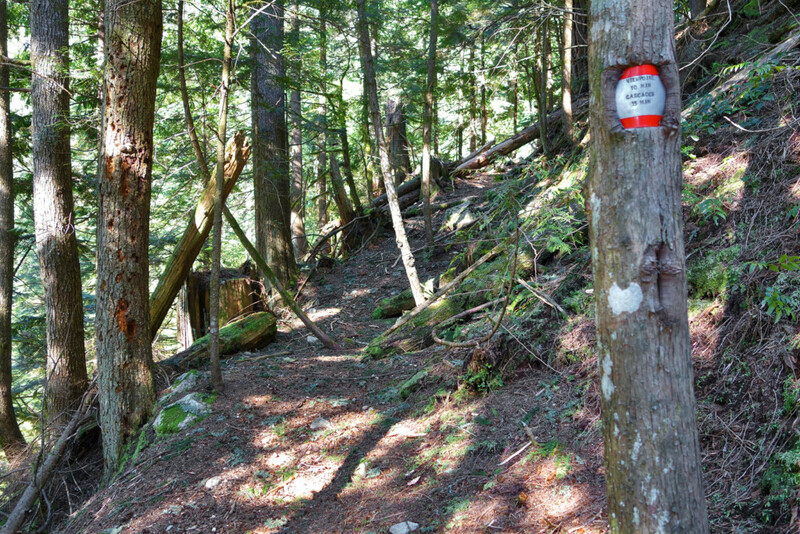 The trail was a little obscure and not well marked in some spots. It’s worth bringing a current map and/or GPS with you to stay on route. We started our day at the top of Skyline Drive in North Vancouver. We parked at the gate and walked up the remaining switchbacks. 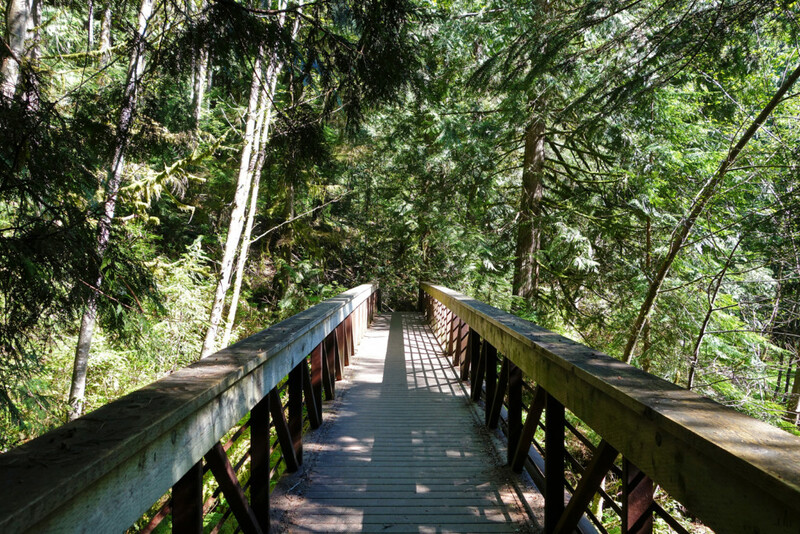 We joined up with the Baden Powell trail and descended a few short switchbacks to the bridge over Mosquito Creek. After crossing the bridge, we took the first obvious trail to the left. 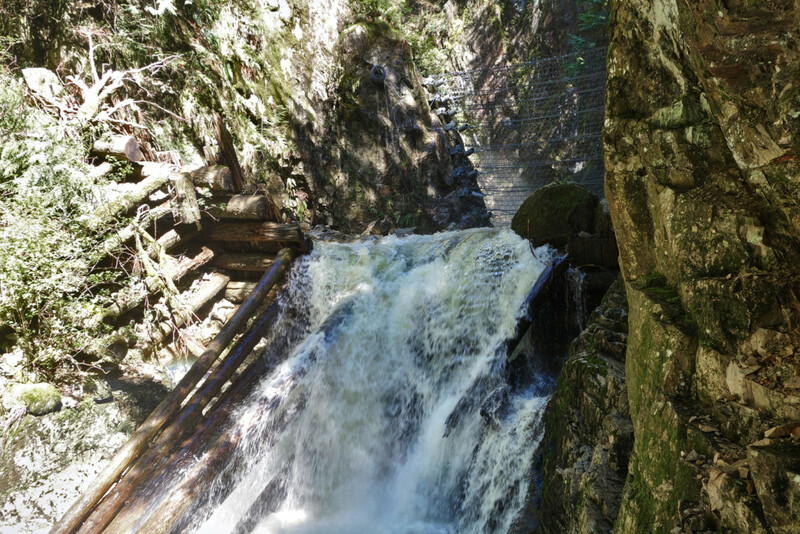 We crossed a small boardwalk and ended at the old historic wooden crib dam. From the dam, we retraced our steps a few meters and picked up a faint trail leading up-slope – this was a slight shortcut to the Cascades trail. 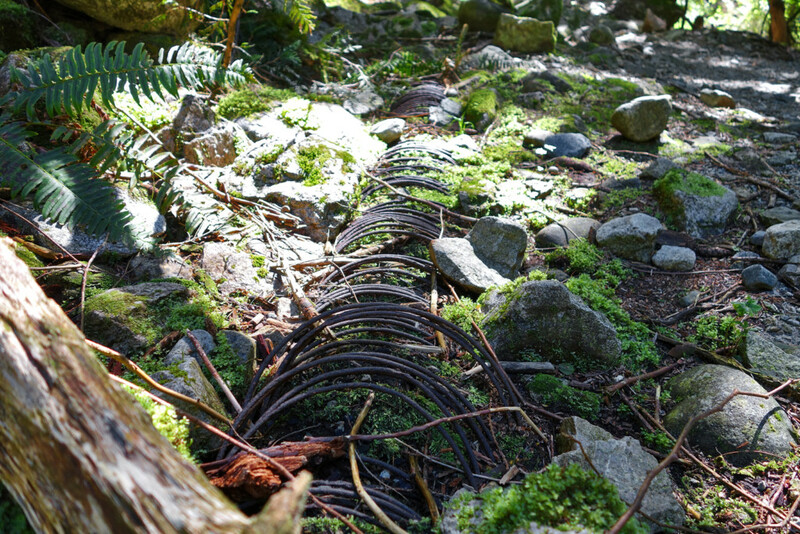 We paralleled the creek and climbed steeply through the forest, along an old pipe that brought water to North Vancouver back when Kennedy Lake was a water source. 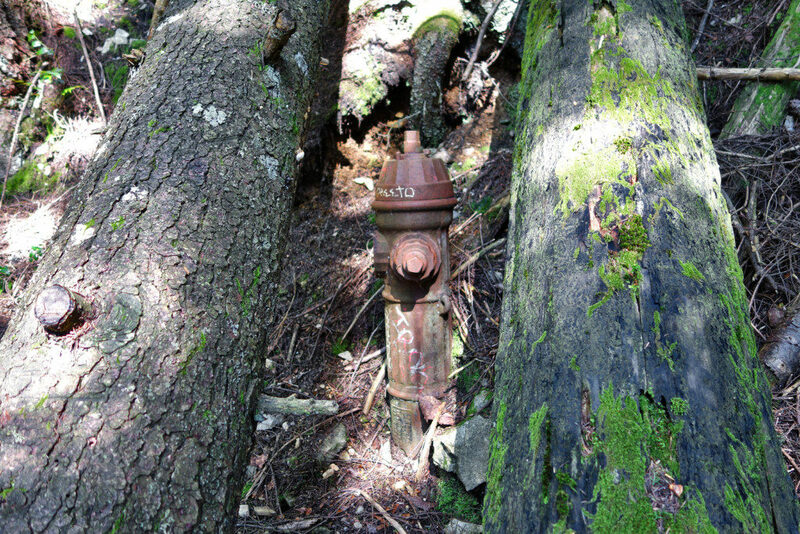 Along the trail, we saw two old fire hydrants that were camouflaged by the forest. 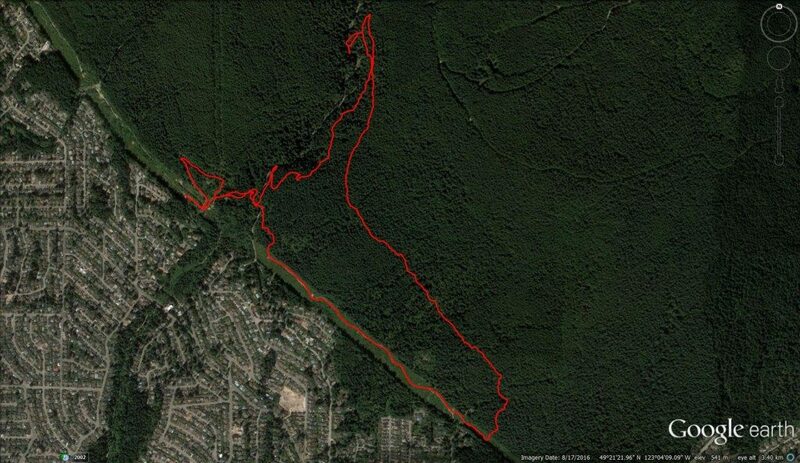 We passed a maze of trails on the lower slopes of Mt. Fromme. We ignored most intersections and took an obvious skid road at elevation ~420m. 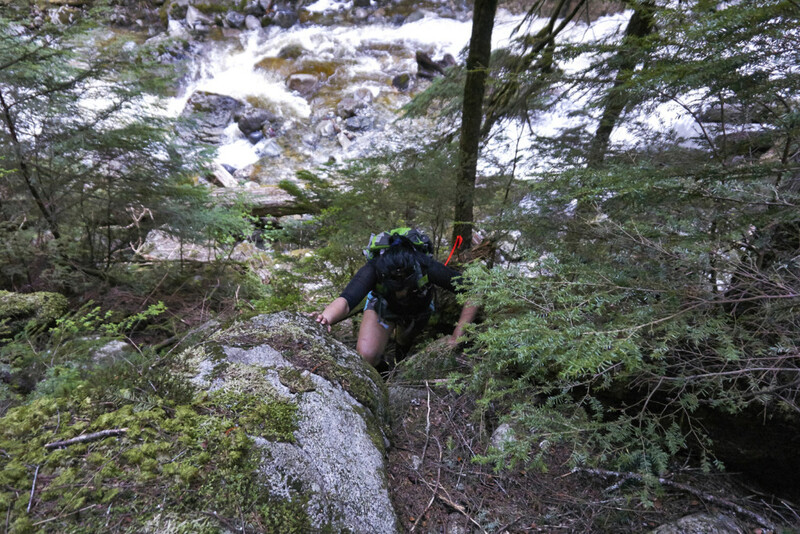 The trail was obscure in some spots; deadfall occasionally forced us to reroute either up, over, or around. Higher up, we crossed a few washouts along the trail. 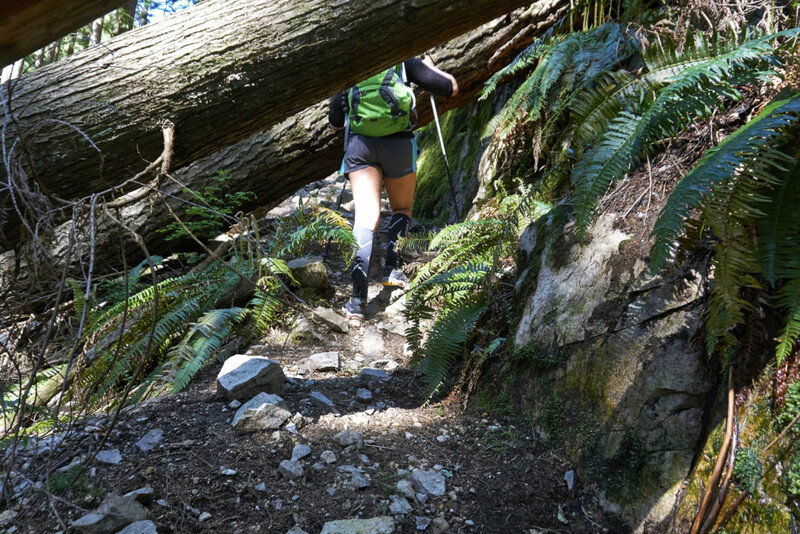 At elevation ~540m, we picked up a faint trail-bed and followed occasional orange flagging down to the Mosquito Creek Cascades. The route was somewhat steep, but the trail-bed was loamy and provided good grip. After a short descent, we were creek-side at the cascades. With the spring melt, the creek was beautiful. From the Cascades, we looked over to the Heritage tree trail we had hiked on a previous trip a few years ago. After an extended break, we retraced our steps back to the junction. We continued past the Cascades junction and on to the Cascades-Dreamweaver-Peer Gynt junction. 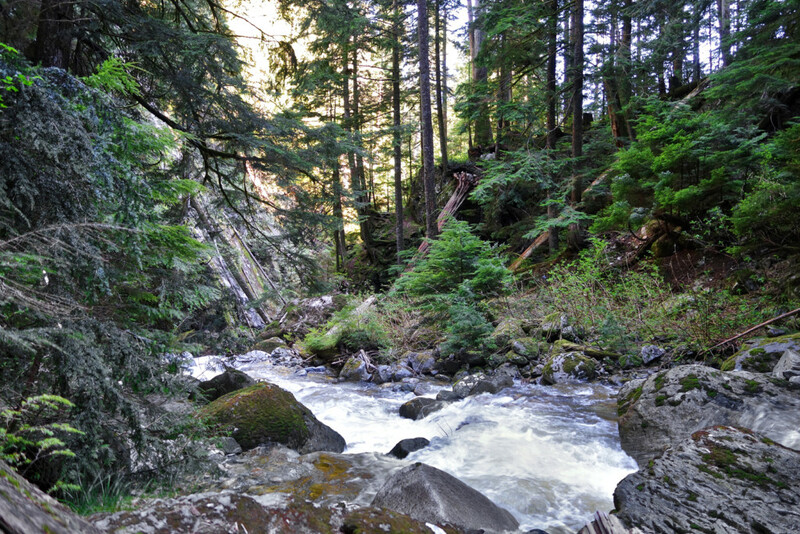 We took the Dreamweaver trail (the middle fork) and started our loop back. The bright afternoon rays lit the entire forest for us on the way back. 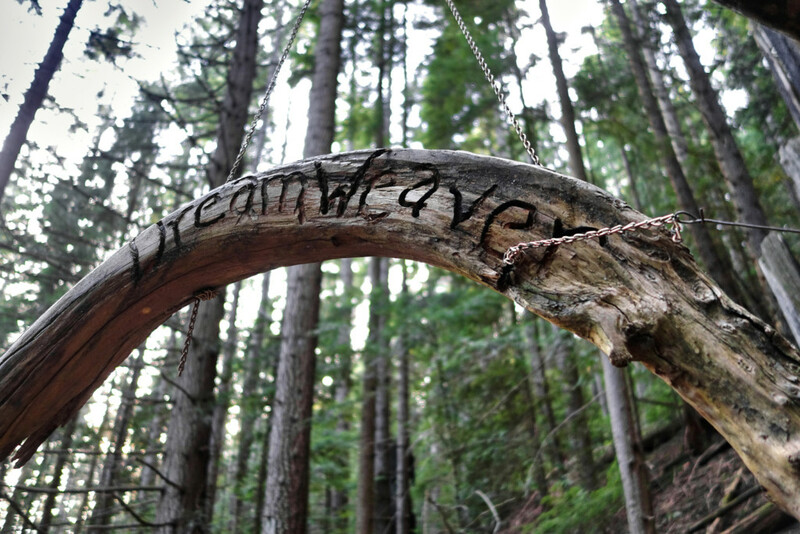 It was my first time on the Dreamweaver trail and I fell in love with the boardwalks and trail signs along the way.